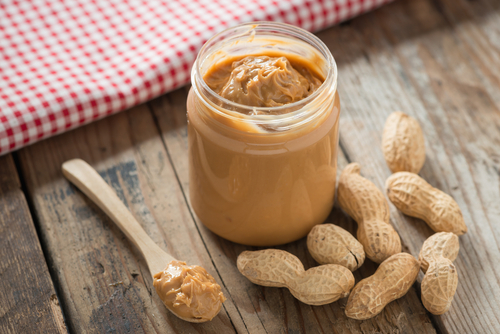 Does Peanut Butter cause Cancer? I was recently told that peanut butter may actually cause cancer. A friend of mine is being treated for breast cancer and was told by the doctor not to eat peanut butter because the mold on peanuts is linked to cancer. I was very surprised to hear that. She was told that almond butter is a safer choice. I searched around and was looking for informaton about this and found this. A mold commonly winds up growing on peanut butter. This fungus Aspergillus flavus releases a cancer causing metabolic product (mycotoxin) called aflatoxin B1, which is a officially recognized carcinogen (cancer causing compound). Workers around peanuts even have to wear protection because of the health hazard. It is common knowledge that farmers and animals around peanuts have increased liver cancer. Aflatoxin is a potent human carcinogen. It is a naturally occurring toxic metabolite produced by certain fungi (Aspergillus flavis), a mold found on food products such as corn and peanuts, peanut butter. It acts as a potent liver carcinogen in rodents (and, presumably, humans). They are probably the best known and most intensively researched mycotoxins in the world. Aflatoxins have been associated with various diseases , such as aflatoxicosis , in livestock , domestic animals and humans throughout the world . The occurrence of aflatoxins is influenced by the weather, (temperature, and humidity – warm & wet is worst! ); so the extent of contamination will vary with geographic location , agricultural and agronomic practices, and the susceptibility of the peanuts (etc.) to fungus before they are harvested, and during storage, and/or processing periods . Aflatoxins have received greater attention than any other mycotoxins because they clearly have a potent carcinogenic effect in laboratory rats and their acute poisonous effects in humans . I have been using almond butter for some time now but have occasionally used peanut butter also. Needless to say I have thrown out my peanut butter, even though it was organic. I don’t know if it applies to organic peanuts. My kids can’t tell the difference between almond butter and peanut butter if combined with jelly anyway. I was also told by a natural doctor that most of the time kids allergic to peanut butter are actually allergic to the mold on the peanuts. The worst offenders are the sugary peanut butter because the moldy taste is disguised with the sugar. Organic peanut butter has fresher peanuts, if it didn’t you would be able to smell the mold because there in no sugar in it. Love to hear your thoughts on this.